Newcastle (UK), April 2019 — New research reveals a potential revolutionary way to treat eye injuries and prevent blindness — by softening the tissue hosting the stem cells, which then helps repair wounds inside the body. The team from Newcastle University discovered that the simple application of a tissue-softening enzyme, collagenase, prevents the loss of corneal stem cells following an injury and could prevent patients from losing their sight. It offers hope to almost 500,000 people a year who lose their sight due to chemical burns including acid attacks. The study, published in Nature Communications, shows that keeping corneal stem cells in a soft environment is fundamental for their reproduction, self-renewal and ability to heal damaged tissue. This discovery was made possible by the development of a sophisticated microscopy technique that enables imaging the physical properties of biological tissues at very high resolutions. Using this technology in collaboration with photonics experts from Imperial College London, the Newcastle team was able to determine that the corneal stem cell niche — the area of tissue in the cornea where stem cells live — is a much softer environment than the rest of the tissue. As the outermost layer of the human eye, the cornea has an important role in focusing vision, yet many of the processes keeping it transparent and resistant to damage are not well understood. Like skin, the cornea is covered by a multi-layered epithelium forming a barrier to physical harm and invading microorganisms. But unlike the skin, when injury occurs the corneal epithelium is repaired by stem cells clustered in the tissue’s periphery, first by quickly dividing in great numbers and then by migrating towards the damaged site as matured epithelial cells in order to seal the wound. However, this healing process can be compromised when injuries reach the stem cell niche. The new study has important implications for developing ways to heal this type of damage. The director of this study and leader of the Tissue Engineering Lab at Newcastle University, Che Connon, Ph.D., explained: “We can now prove that the cornea becomes stiffer when exposed to injuries such as those caused by what are commonly known as acid attacks, and demonstrate that wound healing is impaired due to stem cells differentiating in response to the stiffening of their otherwise soft niche, and not because they are killed during injury, as previously thought. In the work, the researchers from Newcastle, collaborating with scientists at the University of Missouri in the United States, also developed a proof-of-concept therapy to help restore corneal stem cell function and improve tissue regeneration following chemical eye burns. 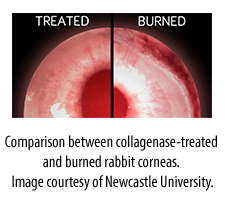 Using live corneal tissues as a model system, the team recreated the effects of chemical burns. After treating the wounded, stiffened areas of the cornea using small and localized doses of collagenase (a tissue-softening enzyme to restore the stem cell niche) once again became pliable and able to support stem cells and promote healing. This collagenase formulation has already been approved for related therapeutic applications by both the US Food and Drug Administration and the European Medicine Agency. The scientists believe the same technique could be applied to help alleviate the lack of corneas available for transplantation by the almost 5 million people suffering from total blindness due to corneal scarring caused by burns, lacerations, abrasion or disease. In addition, an estimated 10 million people worldwide require surgery for preventing corneal blindness as a result of diseases such as trachoma, an infectious eye disorder affecting many people in developing countries. There is a real and pressing need for new therapies to treat these diseases which are both simple and cheap. The scientists intend to further expand the research, working with health partners to test the potential of this study. Prof. Connon explained, “Our research shows that corneal stem cells grow better in softer environments. We now want to build on that knowledge and test this method in patients, using biomechanical modulation therapy to recreate suitable environments for corneal stem cells to thrive within the body whenever their original niche is compromised by injury or disease.